The Associated Bank branch on Main Street in Merrill is partnering with the Lincoln County Humane Society to host a "Dog Days of Summer Cutest Dog Contest" through August 18. 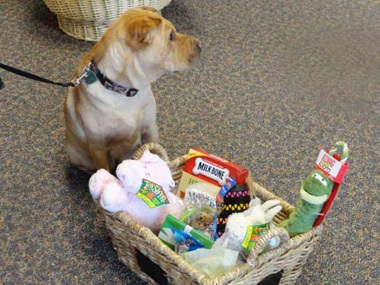 During the "Cutest Dog Contest," customers can enter a photo of their dog to win an Associated Bank "doggie gift basket" filled with toys and treats and have the opportunity to see the many pets available for adoption at the Lincoln County Humane Society. "Associated is proud to partner with the Lincoln County Humane Society to help provide a safe haven for animals and increase their chance of being placed in loving homes," said Jo Waltenberg, Associated Bank Merrill Branch Manager. During the 'Dog Days of Summer' we hope to gather many donations to support the shelter, while building a sense of unity within the community." To participate in the "Cutest Dog Contest" customers must fill out an Associated Bank survey located within the branch and enter a picture of their dog between July 16 and Aug. 18. Voting will take place Aug. 20 through Aug. 25 with the announcement of the winner of the "Cutest Dog in Merrill" on Aug.27. In addition to the contest, the Lincoln County Humane Society will feature a photo display of available dogs within the Associated branch. Customers will have the opportunity to make monetary contributions and donate pet supplies to support the Lincoln County Humane Society. "The Lincoln County Humane Society survives on donations and fundraisers. Two-thirds of our annual budget comes from fundraisers like the 'Dog Days of Summer,'" said Liz Friedenfels, Lincoln County Humane Society Manager. "We are very lucky that for a small shelter, we have such great community support. Every donation is greatly appreciated and makes a difference in the life of a homeless pet."